Anna E. Paradise, 82, of Camillus, passed away Monday, April 8, 2019 at Crouse Hospital. Born in Fort Edward, she graduated from Vincentian High School in 1954 and was employed with Niagara Mohawk in Albany for many years. Anna moved to Camillus in 1964 where she worked in a local gift shop and later was self-employed as a market researcher. She enjoyed working on crafts of any kind, gardening and swimming. Anna was an active communicant of Holy Family Church and served as a Eucharistic minister for many years. She was also active in the Bereavement, Respect Life, Education, Human Development and Liturgy Committees. 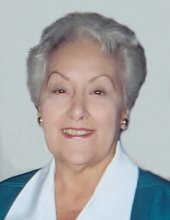 She was a previous member of the Parish Council, Altar Rosary Society and served as a secretary in the parish office. Anna became a Discalced Secular Carmelite in 2000 and served as the community's president from 2006 to 2011 and again from 2014 to 2017. Anna was predeceased by her husband, Gus, in 2009. Surviving are her daughters, Lee Ann (Jason) Fryer of Lubbock, TX and Dana (Peter) Knowlton of Liverpool; granddaughters, Katherine and Nicholle Knowlton; sister, Geraldine (Robert) Rittner of Albany; and many nieces, nephews and cousins. Relatives and friends may call Wednesday, April 10 from 4 to 7 p.m. at the Buranich Funeral Home, 5431 W. Genesee St., Camillus. Services will be Thursday, April 11 at 9:30 a.m. at the funeral home and 10 a.m. in Holy Family Church, where a funeral Mass will be celebrated. Anna will be laid to rest in Greenlawn Cemetery, Warners. In lieu of flowers, contributions may be made to The Carmelite Order, c/o Rev. Paul Fohlin, 166 Foster St., Brighton, MA 02135 or to Holy Family Church, 127 Chapel Dr., Syracuse, NY 13219. To send flowers or a remembrance gift to the family of Anna E. Paradise, please visit our Tribute Store. "Email Address" would like to share the life celebration of Anna E. Paradise. Click on the "link" to go to share a favorite memory or leave a condolence message for the family.